Rebuilt 13 HP Volvo Penta diesel (06/2011), rebuilt CAV fuel pump (06/2010) and rebuilt transmission, new shaft, stuffing box, cutlass bearing & motor mounts (03/2009). Bottom job with Pettit Trinidad 06/2011. 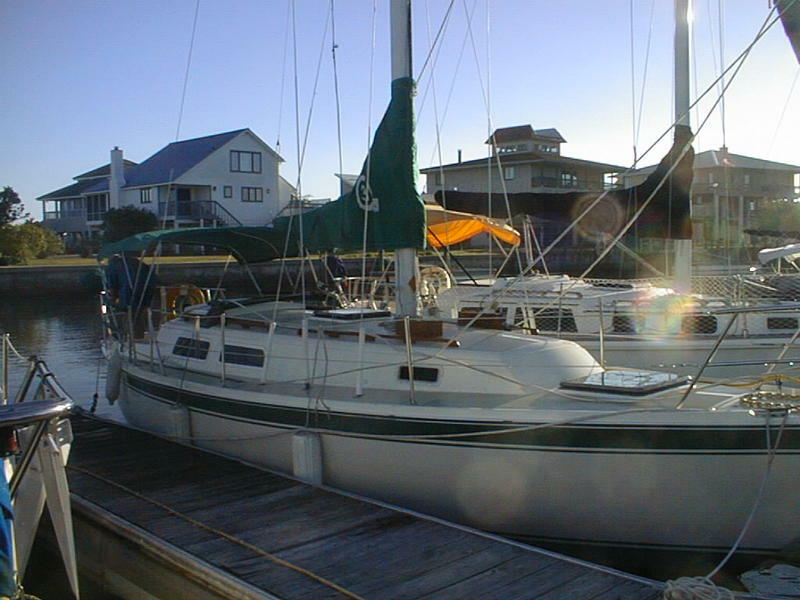 150 roller furling and main in fair condition with recent mainsail cover & bimini. Built in air conditioner and fridge (fridge not working). 10′ Avon inflatible w/ 2005 2.5 HP Nissan 2-stroke. Delta and danforth anchors. New main halyard and reef line routed to cockpit. Gas grill on stern rail, 3 burner alcohol stove/oven and single burner portable butane stove. Built in smart charger for 2 bank battery (size 27M). VHF radio w/ DSC and AM/FM Stereo w/MP3-CD and aux input for MP3 player with 6 speakers. Spacious cabin sleeps 5. No structural or hull defects. $17,500. Will consider trade for 26-28 ft. hardsided RV trailer of comperable value. See Above. Email for additional info/pictures.